They create worlds and cook dinner, slay monsters and do washloads, invent starships and stand in traffic, work their dreams, work a day job, and raise a family. Bram Stoker, PD James, and David Seidler all wrote on the side until they could write full-time. So did the previous authors in this interview series—Diane Capri, Elisabeth Storrs, and Anne R. Allen. Sometimes incubating creativity can give birth to a whole new genre or subgenre. Stoker can be credited with originating horror as a genre. Late-blooming writers Charles Perrault and Jules Verne gave us fantasy and science fiction, respectively. Jeri Westerson wrote for fourteen years while pursuing other careers. She had an agent, interest, and several near misses. But her persistence finally paid off. Today she has five novels published by St. Martin’s Press. 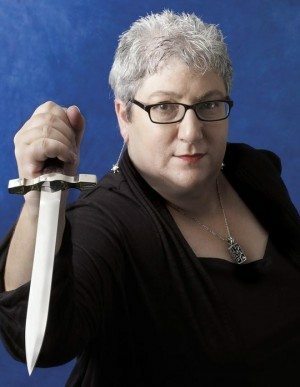 Even more intriguing, she’s credited with originating the “noir” subgenre of medieval mystery. Think The Maltese Falcon teleported to 14th century London. Jeri created Crispin Guest, a disgraced knight who must now live by his wits. Unlike that other medieval detective, Brother Cadfael, Crispin is a deeply flawed secular hero who doesn’t mind getting his hands dirty. He shares many traits with his 20th century counterparts like Sam Spade and Philip Marlowe, like a keen eye for detail, a dogged passion for justice, a weakness for the damsel in distress. But he’s no anachronism. 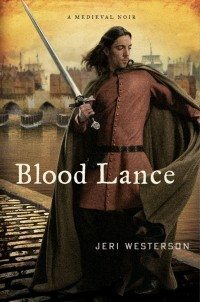 In Jeri’s most recent novel, Blood Lance, Crispin witnesses a man plummet from London Bridge. He fishes the body from the river, convinced it’s no suicide. The plot further involves a knight from Crispin’s past, a beautiful armorer’s daughter, the poet Geoffrey Chaucer, and the legendary Spear of Longinus (said to have pierced the side of Jesus). Sacred relics play a vital role in Jeri’s books, but she leaves them to their mystery. It made me curious about her own writing props and rituals. Jeri, you’ve spun five intricately plotted and researched tales over the same number of years. Do you have a writing ritual or schedule to keep yourself on track? Or perhaps a talisman that inspires you? Do medieval weapons count? Actually, I don’t keep them nearby unless I have to act out a scene, one of the many reasons I don’t usually write at a Starbucks. But I do try to keep to a set schedule. When I get the title/idea for the next book, I begin to outline the plot from my rough outline (the one that sold it to my publisher), doing a chapter by chapter plan. I like to know how I am going to get from point A to B to C and so on, so I find it helpful to map it out. I don’t have to necessarily stick with this plan — in fact, I often veer off the reservation while I’m writing the book — but I need to have that road map to know where I should be going. During this process is when I do some initial research into what will be included in that particular novel. I have a good deal of research on 14th century London and its politics already, as you can imagine, but there are always specific things in each book that need extra research. The relic or venerated object that I use, for one. And then there are real people who stroll through the books and I must address who they are and how to convey their personality, especially when there really isn’t any extant info on them. While writing, I like to listen to medieval-ish music. I do listen to real medieval music and chants, but sometimes it works better to listen to soundtracks from medieval-themed movies. I write every day, that means weekends and holidays. I try to keep to a schedule of a minimum of ten pages a day. That doesn’t sound like much but believe me, it is. Theoretically, after a month I should have a finished first draft, right? It never really works out that way because I sometimes have to stop and research something, which inevitably means a trip to the local university library. It’s more like two to three months. And they don’t have to be good ten pages, but they do have to be ten or more. I know I can always revise them later. Sometimes that means I’m done by three o’clock in the afternoon, and sometimes that means I’m done by midnight. It’s my job, so I think it’s always important to stick to a set schedule. If you could invite any five literary personages from any time period to dinner, who would they be and why? Geoffrey Chaucer, because I really want to know how The Canterbury Tales is supposed to end! Shakespeare, because I want to know if it was him or the earl of Oxford who really wrote all those plays and poetry. Oscar Wilde, because he would be a kick to listen to, and likewise Mark Twain. And finally my character Crispin Guest…so I can apologize to him for all that I did to him. The things we do to our poor characters! You’ve variously been an actress, graphic artist, theology teacher, newspaper reporter, and winery tasting host. What advice or inspiration can you give late-blooming writers with families and day jobs to keep their creative fires stoked? Write whenever you can. Find the story that inspires you, that you absolutely must write and do it! No one ever became a writer by thinking about writing. Writers write. I used to write during my breaks, late at night, and early in the morning. On weekends and every free moment. I still do, only now I have the good fortune to be able to write all day long. Thank you, Jeri Westerson, for reminding us to work hard (ten pages a day! ), keep the faith, and most of all, think outside the (genre) box with our writing. Jeri is currently finishing Crispin Guest’s sixth adventure, Shadow of the Alchemist. You can find his previous outings — Veil of Lies (2009), Serpent in the Thorns (2010), The Demon’s Parchment (2010), Troubled Bones (2011), and Blood Lance (2012) — everywhere books are sold. Even if you’re not a fan of historical mysteries, I can whole-heartedly recommend Jeri’s books for the sensory detail alone. She brings medieval London to life. They’ve been perennial finalists for several mystery-writing awards — the Macavity, the Shamus, the Agatha, the Bruce Alexander, and the RT Reviewers’ Choice. Jeri was recently elected president of the Southern California chapter of Mystery Writers of America. Her home on the web is JeriWesterson.com. I’ll absolutely look out for Geri’s books. I adored Brother Cadfael and read all of Ellis Peters’ novels. This is a time period I love reading about, but would never attempt writing. Thanks, Cathy! I’m with you…love the era, but could never write about it. You’ll like Jeri’s books. 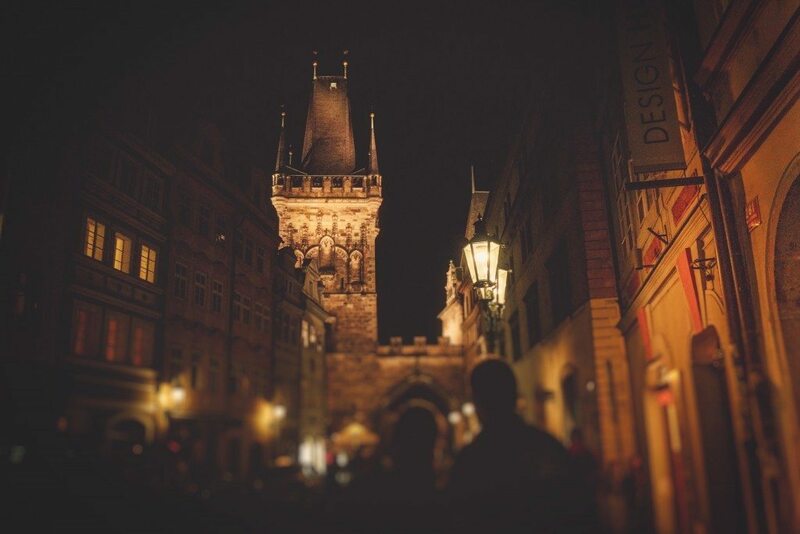 She takes you into the history without sounding like a text book (which is why I read historical fiction). Wonderful interview. I’m definitely checking out her books. And I’m like Cathy–I love historical novels but I can’t write them. So I’m really grateful to authors who can take me time-traveling with authentic detail and strong, believable characters. Sounds as if Jeri does just that. Thanks for stopping by, Anne! I love time-traveling through reading, and Jeri definitely does it well. I think most of us have to go that route unless we’re very, very lucky. I do these interviews as much to inspire myself as others, since I’m still in a sometimes-stressful day job. Thanks for the comment!